FAIRBANKS — A year and a half into Alaska's recession, in which thousands of jobs have been lost statewide, Alaskans are looking for salvation. Some see it in a sound fiscal plan, with the definition of "sound" being up for debate, others in a natural gas pipeline that will cost the state billions of dollars. And some are content to simply wait for the price of oil to bounce back, as it's always done before. With delegations from Nordic countries in Fairbanks last week for the ministerial meeting of the Arctic Council, Alaskans seemed eager to tap the expertise of fellow northerners whose economies these days are highly successful. One talk, "Lessons from Norway: Developing a Dynamic Economy in the Far North," drew a sold-out crowd to Raven Landing, a senior residence and community center. Norway is a much smaller country than the United States, with its population of just over 5 million people, about equivalent to that of South Carolina. But the average Norwegian is wealthier than the average American. In 2015, gross national income per person in Norway was nearly $94,000, compared to $56,000 per person in the United States. And Norway has some similarities to Alaska. The oil sector underpins a large part of the economy. Savings from taxation of the industry go into a sovereign wealth fund, like Alaska's Permanent Fund. The climate is cold and part of the country is above the Arctic Circle. Unlike Alaska, though, Norway's economy is reportedly on the mend after a two-year slump tied to low oil prices. Its oil savings account of $940 billion dwarfs Alaska's Permanent Fund of $59 billion, both on an absolute and a per-capita basis. As a sovereign state, Norway can influence its economy by setting its own monetary policy, while the value of the currency in Alaska is determined by the Federal Reserve. Norway is more than a fourth smaller by land area and on the whole more developed. The social safety net is tightly woven and has wide public support. Morten Brugard, an economist for the government of Norway, had been tapped to give advice to the Fairbanks Chamber of Commerce crowd on "developing a dynamic economy in the Far North," one oil state to another. In the audience were mayors, a university chancellor and a bank president. Brugard came prepared to charm, not to lecture the denizens of this Arctic Council host city. He is the son of a timber industry worker. He's a climber. He candidly admitted to pursuing economics based on an early interest in making money. He joked about his liberal politics to the conservative-leaning chamber while answering audience questions. What he had to say might appeal to Alaskans all along the political spectrum: Efficient government and a strong social safety net are the keys to Norway's economic prosperity. Brugard pointed out that in the United States, the federal government and states offer a large assortment of programs and offices geared toward expansion of business and trade. Norway has one such office, where he works, called Innovation Norway. "It's kind of hard for some foreigners to understand how a one-stop shop can actually work," he said. "In Norway we tried to make it easy to understand just who you will be working with, and there's only one road in." He also thinks universities should tailor their research to foster technological advances that underpin economic growth. The bulk of Brugard's presentation was a pep talk on innovation and how it's an incremental process, like a fisherman who makes small changes to his boat season after season. It's a different approach to Alaska's penchant for funding expensive and dramatic megaprojects, like massive dams, bridges and natural gas pipelines. Brugard did not discuss Norway's oil industry or its sovereign wealth fund, but he did touch on the country's social policies in answer to a question about whether student debt and worries about health insurance in the United States prevent young people from taking the business risks that foster innovation and economic growth. "This is going to be a little, uh, political. When I was younger, I was a … local politician. I was a liberal in Norway so you can imagine what that is, but the main focus in Norway is that education is free, hospitals are free — I pay 40 percent taxes and I'm happy with it — and when it comes to entrepreneurship, the general idea is that we as a society set up a safety net that is going to stop people from falling too far down. You're allowed to aim sky-high and if you don't make it, we'll take care of you anyway." The next day, a government energy expert from Iceland gave a similarly themed presentation, "Lessons from Iceland: How to Reinvent an Economy," to a more liberal-leaning crowd at the Fairbanks Children's Museum. 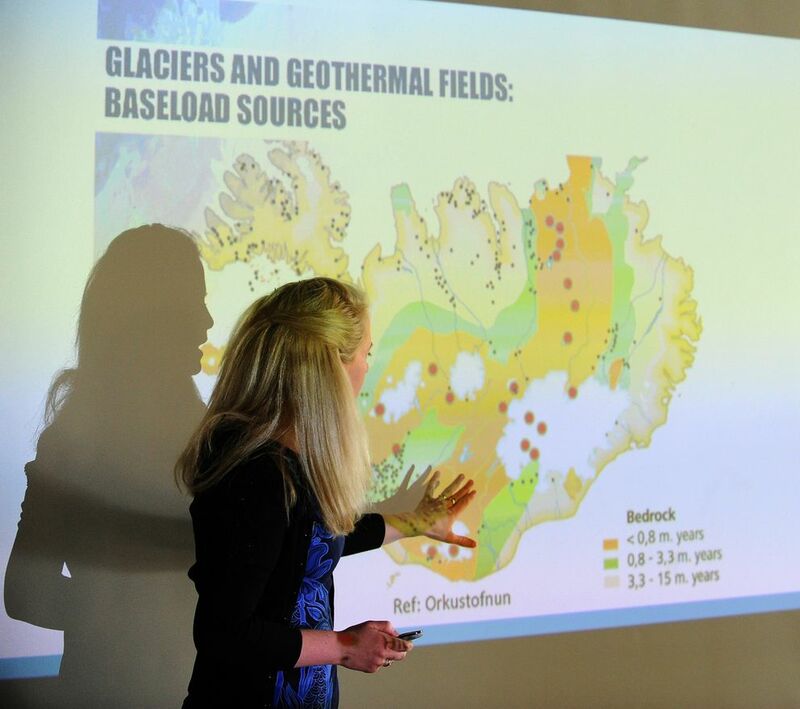 Halla Hrund Logadottir, ministerial adviser for the Icelandic Energy Fund, discussed the country's transition decades ago to getting nearly all its power from geothermal energy. The widespread adoption of geothermal power has saved the country billions of dollars in energy costs over three decades. Logadottir avoided doling out direct advice to Alaska, sticking instead to the story of how Iceland managed to wean itself from oil and coal. Concerns about air quality and the oil embargo of the 1970s played a huge role in pushing the government of the small country of volcanoes and hot springs to shift resources into developing geothermal power. Alaska's geothermal resources aren't as easy to develop. The few sites that show promise are far away from population centers that might benefit from them. Moderator Gwen Holdmann, director of the Alaska Center for Energy and Power at the University of Alaska Fairbanks, said the takeaway wasn't that Alaska should focus on geothermal power. Rather, localities in the state should try to develop their own energy sources, whatever they may be. Logadottir, a graduate of Harvard's Kennedy School of Government — an institution sometimes referred to as the Alaska midlife crisis school — ostensibly focused on homegrown energy and the policies that helped geothermal spread, but there seemed to be a subliminal message: Visit Iceland. The highly appealing slides of Icelandic landscapes embedded in her PowerPoint perhaps inadvertently functioned as advertising for the country's tourism sector, which has grown by an annual average of 20 percent since 2010. Spending by visitors has been a major factor in Iceland's emergence from the devastation of the global financial crisis, which took down the country's financial sector and necessitated borrowing more than $4 billion from neighboring countries and the International Monetary Fund. Lax financial regulations were a major reason for the country's banking crash, so if Alaska can take one economic lesson from Iceland, it may be this: Don't let bad policy decisions ruin the economy.